Congressional Republicans and the Trump administration are trying to drum up support for a controversial plan to transform the Medicaid program from a health care entitlement for the poor and disabled to a series of block grants to the states. The idea is to save the federal government billions of dollars in the coming years while giving state officials more flexibility to set eligibility requirements and spending levels. Kellyanne Conway, senior adviser to President Trump, recently told NBC News that the change would shift spending decisions away from Washington to state officials “who are closest to those in needs” and best equipped to root out fraud and waste. Health care policy experts have repeatedly cautioned that the Republicans’ Medicaid overhaul proposals would end up being a much better deal for the federal government than for the states. And a new study by Avalere Health, the health care consulting group, convincingly documents the extent of that disparity. The analysis released Monday shows that the federal government would save an estimated $150 billion over the coming five years under a new block-grant approach, or $110 billion under an alternative scheme in which the federal government provides payments on a per capita basis. While state officials would have far more latitude to run the new Medicaid program and set policy with block grants, practically every state and the District of Columbia would suffer funding losses. Those losses would range from as little as 4 percent in Wisconsin to 62 percent in Arizona. If Congress opted for a Medicaid per capita model, 24 states would receive an increase in federal funds, while the remaining 26 state and D.C. would suffer losses of up to 30 percent. A block grant as conceived by House Speaker Paul Ryan of Wisconsin and other GOP leaders would essentially cap federal Medicaid funding as a way of achieving major savings in the coming decade. Currently, the federal government picks up a fixed percentage of states’ Medicaid costs — on average 57 percent — and the states cover the rest. Under a block grant approach, states would receive a fixed amount based on a formula, with the states responsible for picking up any additional costs above the cap. Capping federal funding is popular among Republicans on Capitol Hill, and the Republicans would let states choose whether they wanted to receive a block grant or a per-capita allotment. Under a Medicaid per capita approach, the federal government would set a limit on how much to reimburse states per enrollee, according to a Kaiser Family Foundation analysis. 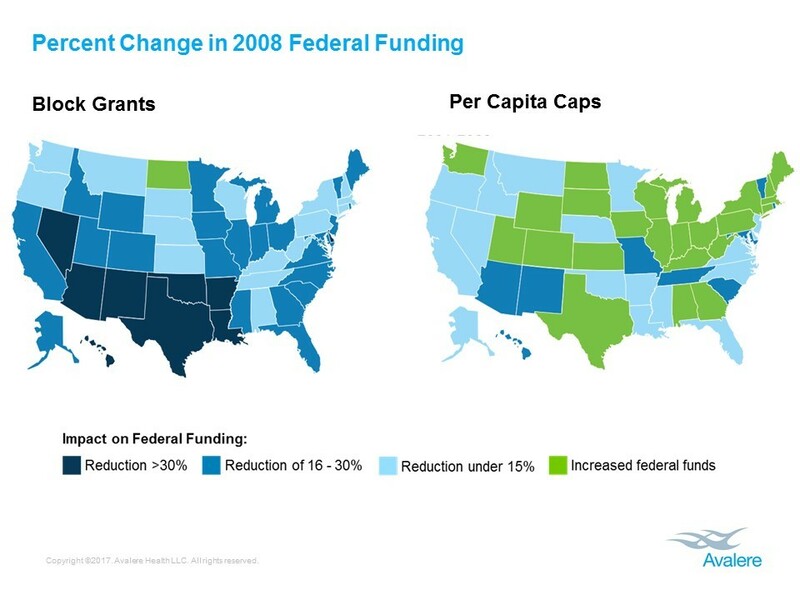 While block grants provide a set amount of federal spending regardless of enrollment, per capita payments to states would reflect changes in enrollment. A per capita approach would not take into account changes in the costs for each enrollee beyond an established cost growth limit. In order to save money, the federal government would set per capita growth amounts below the projected rates of growth under existing law. That would put a squeeze on the states and force them to find savings, reduce their rolls, or limit their services. The Republicans have promoted these ideas as part of their larger effort to repeal and replace the Affordable Care Act. The proposals face staunch opposition from Democrats, liberal advocacy organization and seniors’ groups including the AARP, which wrote a letter to lawmakers last week opposing both block grants and per capita caps. The 1965 Medicaid law today covers about 81 million people, including poor children and pregnant women, the disabled and poor older people. Republicans have long complained about runaway spending, fraud and waste, and GOP efforts to convert Medicaid from a federal entitlement covering all eligible people to block grants to the states dates back to the Reagan administration. Under either scenario of block grants or per capita limits, states likely would respond by cutting enrollment, limiting benefits or reducing payment rates to providers and plans, according to Pearson. Last November the liberal-leaning Center on Budget and Policy Priorities released an analysis showing that a block grant proposal included in a House GOP budget plan for fiscal 2017 would cut federal Medicaid funding by $1 trillion — or nearly 25 percent — over ten years, relative to current law. By then, federal funding for Medicaid and the Children’s Health Insurance Program (CHIP) would be roughly $169 billion, or about a third less than what it would be under existing law. Another analysis by the Urban Institute of a previous block grant proposal promoted by Ryan in 2012 projected that between 14 million and 21 million people would eventually lose their Medicaid coverage. Avalere said it used Centers for Medicare and Medicaid Services (CMS) projections from the 2016 Medicaid Actuarial Report and the National Health Expenditure Accounts by state of residence in conducting its research, and the group’s models assumed a Medicaid growth rate tied to inflation. The report’s historical simulations start in 2001, with a base year of 2000 for determining initial federal funding levels. The researchers cut off the state level simulations in 2008, to avoid measuring the effects of a major economic stimulus program and the Affordable Care Act, which authorized an expansion of Medicaid. 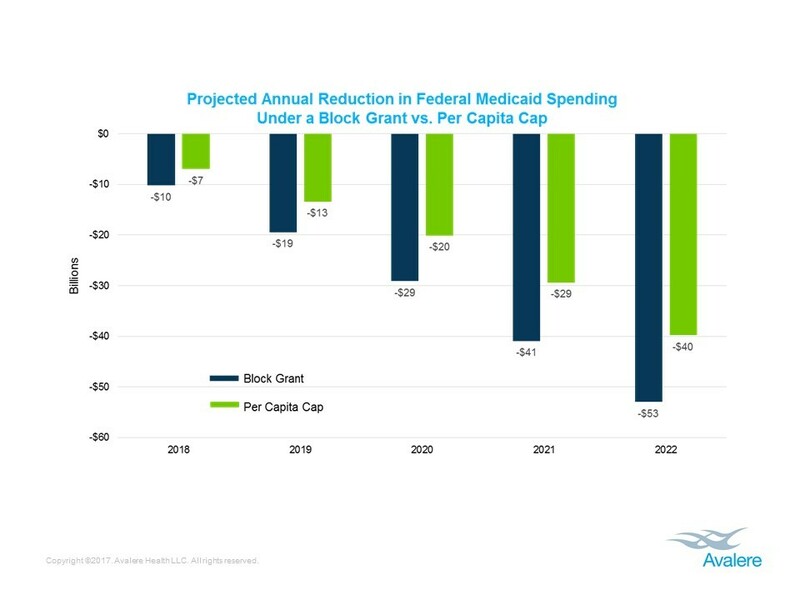 Presumably, the extent of the federal government’s savings and the states’ losses under a block grant approach would be considerably higher if you factored in Medicaid expansion.